Background: 125I-insulin and 125I-IGF-I distribution during internalization is seemingly a key condition that determines hormone functional role in a given organism. Endocytosis course of 125Iinsulin and 125I-IGF-I in isolated chicken hepatocytes occurred in different ways as compared with rat hepatocytes. 125I-insulin and 125I-IGF-I distribution across cell membrane during internalization was different in bird cells. Objective: Analysis of their distribution across the cell membrane in chicken cells. Methods: Hepatocytes were isolated according to Berry and Friend (with modifications). Hormone/ receptor complex internalization course was evaluated in a separate experiment with 125I-insulin or 125I-IGF-I. It included a four steps procedure: cells preincubation with labelled ligands at 6°C, incubation at 12°C and 37°C to activate internalization; two-stage cell washing with another buffer, and lastly, radioactivity was counted stepwise in first and second precipitates. 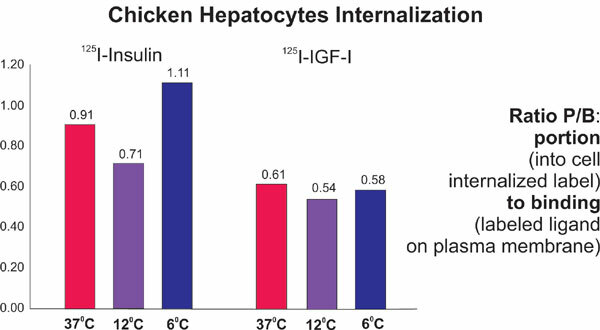 Results: 125I-insulin and 125I-IGF-I distribution across cell membrane during internalization into chicken hepatocytes considerably differed from the same peptides distribution in rat hepatocytes. In chicken hepatocytes, 125I-insulin distribution, temperature dependent in a variable manner, with clear “intracellular” type distribution at 6°C, and stable, resistant to changes in incubation temperature, “membrane” type of 125I-IGF-I distribution were revealed. Conclusions: 125I-insulin and 125I-IGF-I distribution is a specific characteristic of internalization, which is capable of changing, despite retaining basic internalization characteristics of both insulin and IGF-I in the cells of different animal species. The differences of 125I-insulin and 125I-IGF-I distribution types in chicken and rat cells, allow us to guess correctly other functional roles of insulin and IGF-I in birds as compared with mammals. Insulin, IGF-I, receptor, endocytosis, internalization, temperature, hepatocytes, phylogenesis.